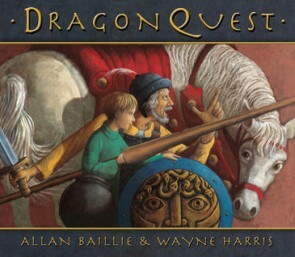 Here is a book which speaks to the dragon slayer lurking in fertile young imaginations. A noble Dragon Fighter and a brave boy set out on a daring and dangerous adventure to seek out the last dragon. Will they make it to the top of Glass Mountain where the fearsome beast lives? Originally published by Scholastic in 1996, it is now a Walker Classic published in 2012. Click here to read more about Wayne Harris. Allan Baillie was born in Scotland in 1943 and came to Victoria, Australia with his family when he was six. They moved to Emerald, then Geelong (he still barracks for the Cats), Drysdale, Portarlington and later Melbourne. Allan began writing stories for fun while still at school. He is now one of Australia’s most successful writers for children. His novels, which include Little Brother (1986), The China Coin (1992), Saving Abbie (2000) and Treasure Hunters (2002), have won him acclaim, awards and international recognition. His books have found success in Japan, Sweden, Holland, Germany, France, Spain, the United Kingdom, the United States, New Zealand and South Africa. His most recent books for Penguin include a collection of short stories, A Taste of Cockroach (2005), and Castles (2005), a superb picture book for young children, illustrated by Caroline Magerl. Allan’s most recent novel, Krakatoa Lighthouse, won the 2010 NSW Premier’s Literary Patricia Wrightson Award. Outpost is his forthcoming novel, and he is currently working on the next two after that. Allan spends most of his time with his wife Agnes in Avalon, north of Sydney, but they travel regularly to far-flung places including Anak Krakatoa, the Son of Krakatoa, which they climbed during a quiet period. Wayne Harris is an award-winning illustrator and designer. He won the APA Best Designed Picture Book of the Year Award for A Bit of Company by Margaret Wild and for Gordon’s Got a Snookie by Lisa Shanahan. He was shortlisted in the 1995 NSW Premier’s Award for writing Judy and the Volcano, the same year Going Home was named an American Library Association Notable Children’s Book. He works as a designer for Walker Books Australia and also teaches design and illustration. He has most recently illustrated Edge of the World, written by Ian Trevaskis, published by Walker Books.